always commented about how he is so handsome. It took a long time to figure out that he came to the US as Chaim Woskobojnik. According to the Hamburg passenger list, he left Hamburg, Germany the 12th of April 1899, arriving on April 25th. He traveled steerage, and arrived in New York. He was born around 1867 in the vicinity of Rowno (Rivne), Russia (now Ukraine). Hyman's occupation is listed as a journeyman shoemaker, which makes sense since he ended up in Lynn, Massachusetts the then "shoe capitol of the world" during the turn of the 20th century. Married to Sophie, they had 5 children. Sophie brought the 4 girls to the US on the 1st of September 1903, leaving from Rotterdam, arriving at the port of New York, with the last listed residence as Derazhno, Russia (now Derazhne, Ukraine). Sophie was born around 1873. Hyman and Sophie's 5th child, Louis, was born in Massachusetts. 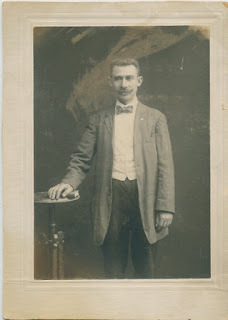 Chaim met his family in New York - Tzirel (Sophie), Maelke (May), Sure (Sara), Feige (Frances), Chane (Anna) and brought them to Lynn, MA to settle in on Summer Street..
January of 1903 Hyman made his declaration of intention at the Lynn Police Station. On August 13th, 1906 he became a citizen. On both documents the witnesses were Arthur Levine and Charles Crowley. Arthur is believed to be a cousin, and further documentation and investigation is trying to prove that point. Hyman could not write - he made "his mark". By 1912 tragedy struck the family with Sophie (daughter of Reb Ozer) passing away at the age of 44. Hyman married a widow with two children not long after and family life became complicated with five children from one family and 2 from another. Hyman and his second wife had one child together, Jacob. Hyman (Chayim Ze'ev, son of Reb Yaakov Halevi) died February 20,1940. He and his second wife are buried in Haverhill, MA.